Located in a quiet suburb in Newport. Junction 24 on the M4 motorway and 4 minutes drive from there and the Celtic Manor Resort. 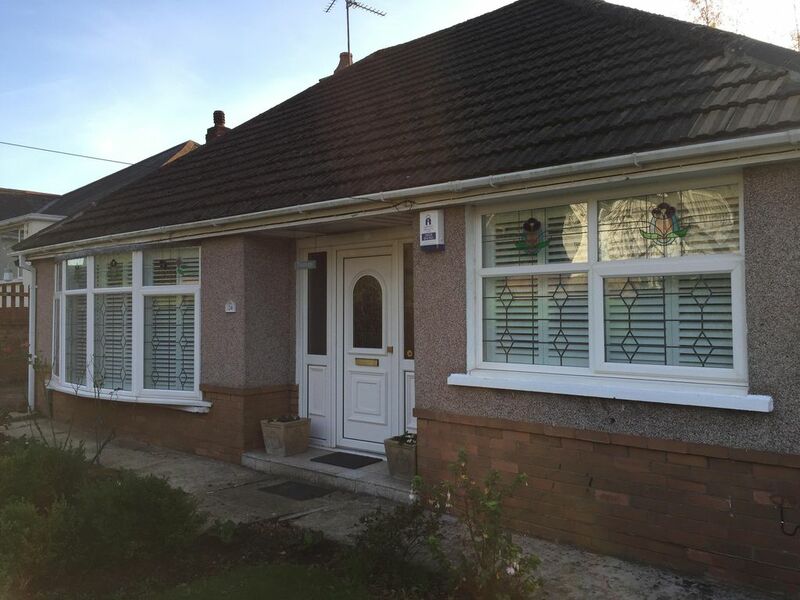 This is a 2 bedroom fully refurbished and modernised bungalow that sleeps up to 6 people. The master bedroom is decorated in the latest shades and has a luxury super king size bed, tv and wardrobe space. Bed 2 has 2 x 3ft luxury single beds c/w tv and an open wardrobe. The sitting room is decorated in a contemporary/classic style with a sofa bed. The bathroom consists of a glass walk-in shower. The kitchen adds more fun to the property and is decorated in an abstract yet funky style that depicts a scene. Coffee maker and a nice fridge to keep your wine chilled. Usual appliances, washing machine, dryer etc. WiFi as standard of course. Garden to the front and rear of the property with a beautiful view from the back. Wheelchair friendly with access to the front via a gentle slope. Plenty of off rd parking. All of the usual safety features including a co2 detector and fire extinguishers etc. Local amenities a short drive away. Newport is the gateway to Wales with lots of local history. Town and country, beaches mountains all within an hours drive. Thank you so much for your kind words. Hope to see you again in the future. Our family of 5 spent four nights in this funky bungalow in a quiet neighborhood. Upon our arrival, we were warmly met by Julie, the housekeeper, who gave us a quick tour of the place. We were pleasantly surprised to find cereal, coffee, tea, and milk stocked for us so an immediate trip to the store wasn’t necessary. The kitchen is small with little room for groceries we purchased so they all went in the spacious refrigerator. Cooking for a family with 3 teenagers was a challenge with the few small pots and a small frying pan that had seen better days. The bathroom had a lovely supply of shampoo, lotion, etc. if needed. The house was super clean. The beds were comfortable. The location was perfect for us while visiting friends and seeing sights in the area—The Big Pit Mine, Tintern Abbey, Puzzlewood in the Forest of Dean, Caldicot, and Chepstow. This was a fun and funky place to stay! Thank you so much those kind words you wrote about our lovely bungalow. We do try our best to accommodate our guests, and we can only imagine the amount of food you would have to buy to keep three hungry teenagers fueled. Also, thank you for letting us know about the frying pan, that was replaced immediately. All in all, we are very happy that your stay in Wales was a pleasant one, and would love to welcome you guys back in the future.